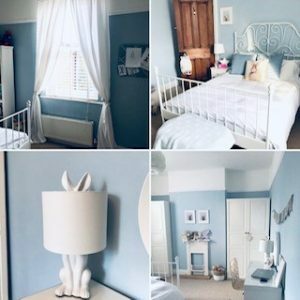 We are Willow & Maine and we have very kindly been invited to take over the blog this week by the lovely team at Pure Concierge Cleaning Co. Simon and Lindsay, the owners of Pure, are two of our clients, we have completed one project with them and are just about to start on a second one. A little bit about us… we are Willow & Maine, a small Newcastle based interior design and styling consultancy covering Northumberland, County Durham, Teesside and Tyne and Wear. We offer bespoke interior design and styling solutions for every size of project, with packages to suit all budgets. We work with local trades, including Pure Concierge, to provide quality projects at reasonable prices. Our most recent projects include an Air Bnb Victorian house rental in Durham, a bedroom in a barn conversion in County Durham and a house style for a home in Rowlands Gill to enable it to be put on the market. I thought I’d share with you a budget plan for a recent project. This was for my toughest client yet, my youngest daughter Emma, aged 9. Although she is a girly girl, she gave me a wish list that included blue walls, a double bed and a new carpet! The starting point was the wallpaper. 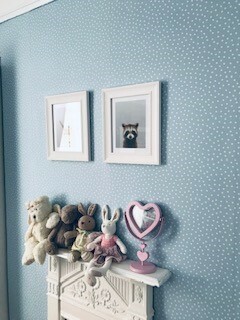 After looking for something a bit fun, I found some lovely duck egg blue polka dot wallpaper. We colour matched it with Valspar paint and the woodwork was painted with egg shell. I also painted the cream bookcase a lovely crisp white with chalk paint. The wardrobes and desk were existing items in her room, I simply re-planned the space and purchased accessories to compliment the other items and bring a fun coordinated look. This project would be the equivalent of our interior design package: detailed consultation, mood board presentation, full shopping list (tailored to the client’s overall budget), including furniture and accessories and final style and stage. If you have any questions or have a project you need help with don’t hesitate to get in touch we are a friendly bunch. Thank you for your time Lorraine. We’ll be back to normal next week but will be inviting guest bloggers every now and again (mainly our clients who have synergy with our business). If you would like to feature just drop me an email on simon@pureconciergecleaning.co.uk. Have an amazing week and enjoy the sun!